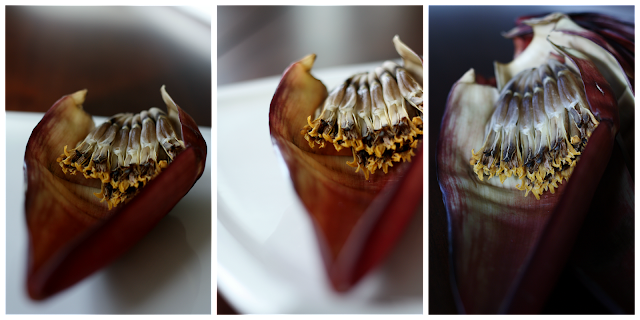 Banana flower-head, appearing in the Indian Groceries during this season. Prompted by a recent visit to India and the opportunity to sample Bengali cuisine which included, Banana Flower cutlets, we picked up a 'banana flower head/ Vazha Khumbu'. The opportunity to sample a traditional Bengali spread was at Kolkata's Bhojohari Manna. Bhojohari Manna in Salt Lake: Served in banana-leaf -lined plates and dish of Shatkora slices ( Citrus Macroptera) and green chillies, seating at the Salt Lake location. 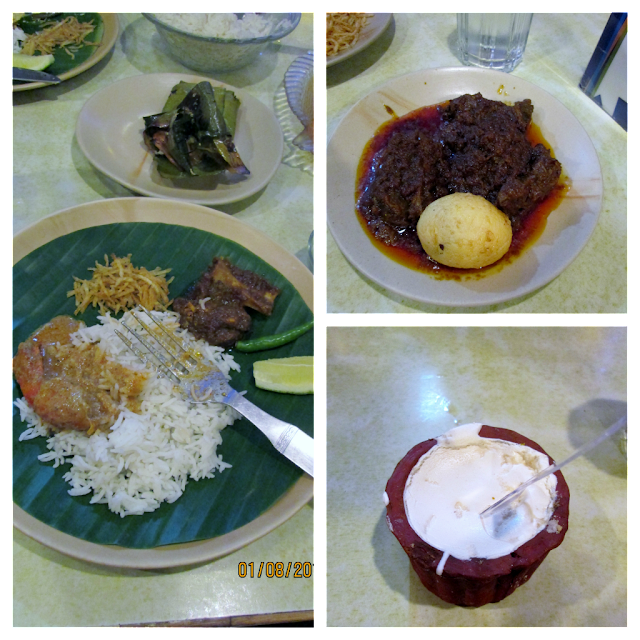 Every order was an individual portion: Steamed banana leaf parcels of fish in mustard spicing- Bhetki Paturi, Malai Chingri, Dak Bangla Mutton Curry with a fried boiled egg and the divine, Nolen Gur Ice Cream in un-glazed earthenware. All photos with a point and shoot Canon. a garnish of fried potato flakes. The visit came through in a quintessentially Bengali way, with warmth and splashes of humour. We were urged to visit, a call was put through, assurances received that it being a 'working day' a table would be free and suggestions for ordering were given. All of us at the table were novices, but it ended up appealing to different palates. For friend's the mustard spicing was a hit! Each dish was unique and it was worth every rupee and more! We stopped at 2 tiny clay pots of this divine, mousse-like ice-cream with the gur paste at the bottom. Sharing it in tiny spoonfuls, it was perfect and left us wanting more. However here we did a variation, a very traditional South Indian preparation. Similar to the Parippu Vada/ Deep Fried Lentil Discs, the Vazhapoo Vada. 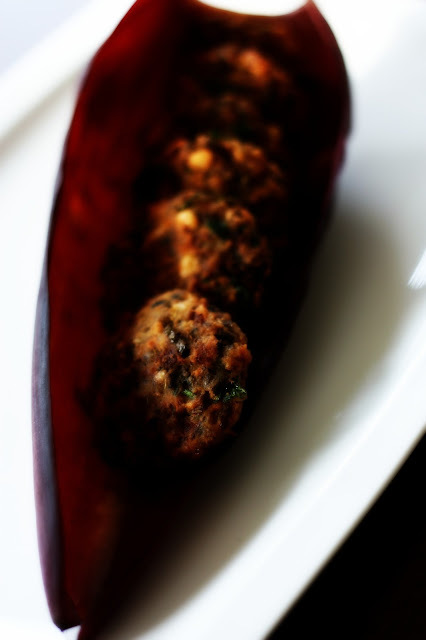 The recipe is popular in Chettinad Cuisine. Like the parippu vada, it seemed to have come into our region from the Tamil cuisine. The recipe is linked to Sara's Traditional and Native Recipes and to a favourite, My Legume Love Affair, MLLA # 56 hosted by Lisa's Kitchen. Created by the lovely, Well Seasoned Cook, Susan. Here is a very helpful post by a very talented and amazing fellow blogger, Swathy of Zesty South Indian Kitchen. It shows you how to 'prepare' the flowers. After 1/2 hour to one hour, squeeze out the chopped banana leaves. Rinsing out the buttermilk is optional. Cook with salt and turmeric powder and just enough water. 1/2 Cup dried channa dal/Split Bengal Gram soaked for a minimum of half to one hour. Add the cooked banana flowers, finely chopped green chillies, finely choipped ginger, finely chopped onions, fennel seeds, chopped curry leaves and chopped coriander. Take approximately 2 tbsps of the mix and flatten into a disc. I have made these vadais with pottukadalai as suggested in a cookbook. Nice that you have used channa dhal. I have not had vazhaipoo in a long time, we do not get them here. I did not know about Pottukadali in this recipe Lata; will definitely try that variation too. I am surprised that you do not get Vazhapoo there. I love this. They call it mocha bora. Thanks Sangeeta, I wonder how the spicing for that recipe is! Hope to see it from you soon! That's a delicious spread, vazhaipoo cutlet is brew n interesting n liked the way they served with fried potato flakes...your vada looks yummy n well made! Oh wow...super yummy delicious... :-) lovely clicks.. I am absolutely in love with vazhapoo pictures. And the vadas must have tasted yum. Thanks Shri, for mentioning my blog. Vazha khumbu vada adipoli. I love it. Thanks Jay, Julie, Raji, Divya, Sharanya, Sangeetha! A totally unfamiliar dish to me but I know I would love it. Thanks so much for sharing with MLLA. SO here's the deal, Shri. You come to Pondy for toast with Amul butter and Roselle jam, and I crash at your place for these gorgeous vadas. Okay? ;) Manisha at Indian Food Rocks did a piece on Vazhapoo, as well, but I don't recall if she had a recipe... They're just such lovely and unusual flowers, the banana's best kept secret, ha! Perfect Deepa! You are most welcome. True, this is akin to the coconut tree for us! Thank you Divya, Jyoti, Srivalli, Nami and Maha! 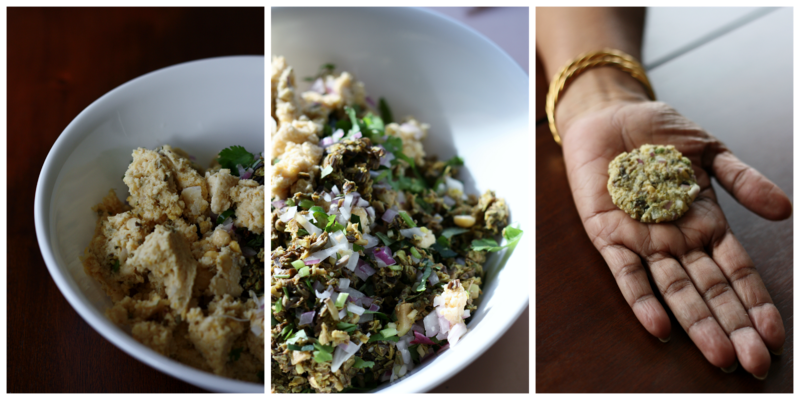 Banana blossom vada is a family favorite.. nice stepwise pics you have in here! !